As durable as your wrought iron fence is, you still need to do all you can to ensure it will last. As durable as your wrought iron fence is, you still need to do all you can to ensure it will last. But don’t forget that their main threat is rust. How can you prevent rust? 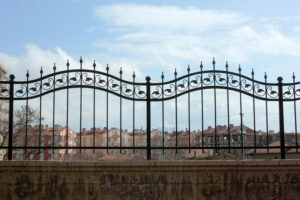 Let’s answer this question and take a closer look at how to take care of your wrought iron fence. Rain, snow, and ice during the winter can all cause your wrought iron fence to rust. If your fence isn’t properly protected, then it could easily fall victim to this major problem. Whenever you see weeds or vines growing around your wrought iron fence, be sure to get rid of them. Although vines can look pretty on your fence, you should make sure they won’t harm your fence. Seal your fence against possible moisture and scratching damage. Sometimes, even the right paint will make a huge difference too. When it comes to cleaning most everything, all you need is some warm water and plenty of soap. Keeping your wrought iron fence clean isn’t much different. By using soap and water, you can clean away any early warning signs of rust you see. For the smaller areas that might be hard to reach, you should use a brush with a smaller head, such as a spare toothbrush you don’t mind giving up. Preventing rust is one of the most fundamental tasks involved when making sure your wrought iron fence will last you for years to come. However, if rust has taken hold and is steadily causing damage to your fence, you might need to replace the affected sections entirely. That said, you can also repair the rust when normal cleaning won’t be enough. Sandpaper and a wire brush are two tools you can use to wipe the rust away, and then resealing your fence will do the rest. This entry was posted on Friday, February 2nd, 2018 at 12:38 am. Both comments and pings are currently closed.